Annatto is a food colorant used as condiment spice in the food industry. 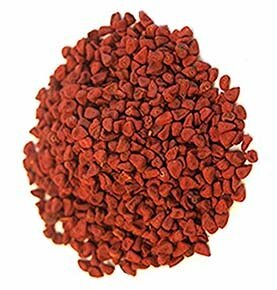 It is obtained from the pigmented, outer coat (pericarp) of achiote seeds. Achiote plant is indigenous to the Central and tropical South America. The name achiote is derived from the indigenous Aztec dialect, Nahuatl. Scientific name: Bixa orellana L, in the Bixceae family. Lipstick seeds, roucou, etc, are some of the other names of annatto. Annatto seeds. Note for pyramidal-shape, brick red seeds. Bixa is a tropical, evergreen shrub growing about 3-6 meters tall. It flourishes well under warm, humid climates. Each season, it produces numerous spherical to ovoid, fleshy, green, greenish-brown or red (in mature) fruit pods covered with bristles on their surface. When mature, the fruit pod splits open to reveal 20-50 seeds, which actually are commercially important source of annatto pigments. Annatto seeds feature conical, or triangular to pyramidal in shape and measure 4.5 mm long, with bright orange-red fleshy coats (arils) which imaprt slightly peppery flavor with a hint of nutmeg in their aroma. Their pigment color ranges from yellow to red depending upon the soil type, and concentrations of carotenoids. Although not much of calorific value, annatto seeds hold important role as natural, chemical-free food colorant, since it does not seem to change the food value. Its use as a safe food additive is also acknowledged by the US-FDA and WHO. The color pigments in annatto seeds are apo-carotenoids namely bixin and nor-bixin, which extracted from the outer coating of the seeds. Bixin is a fat-soluble carotenoid which contributes for majority of (about 70-80%) pigment in the seeds. Besides bixin and norbixin, the other chemical substances that have been isolated from the seeds of annatto are isobixin, β-carotene, cryptoxanthin, lutein, zeaxanthin, orellin, bixein, bixol, crocetin, ishwarane, ellagic acid, salicylic acid, threonine, tomentosic acid, tryptophan, and phenylalanine. Annatto seeds are also rich source of organic volatile compounds such as bornyl acetate, copaene, cubebene, β-pinene, 4-methylpyridine, elemene, cyclosativene, geranyl phenylacetate, 1-heptanetiol, 3-methylpyridine, β-humulene, isoledene, d-selinene, etc. These biological compounds in them have potential use as antiviral, antibacterial, anti-inflammatory, insect repellant, anti-malarial agents in the traditional medicines in Brazil, Mexico and Peru. The indigenous Amazonian people use the annatto as a condiment as well as to treat sunburn, wounds and bruises. Several in-vitro studies suggest that the extracts of Bixa orellana showed biological activities such as antioxidant, anti-allergic, and anti-tumor for carcinoma of the lung. Annatto seeds contain health benefiting apo-carotenoids such as bixin and nor-bixin compounds. Phenolic and flavonoid antioxidants in annatto help preserve the food its nutritional values. Medicinally, annatto's antiviral, antibacterial, anti-inflammatory, insect repellant, anti-malarial properties have been exploited by indigenous Amazonian people in Brazil, and natural therapists in Mexico and Peru. See the table below for in depth analysis of nutrients: Annatto chemical composition. Dried annatto seeds in packs and bins of various brands available in the US stores year-around. Choose brick red seeds, from an authentic company, labeled for nutrition chart and expiry date. One may also buy ready to use ground annatto powder, paste or oil (annatto cheese colorant). Once at home, annatto powder can be stored in an air-seal container and placed in a cool dark place away from sunlight and humidity. Store annatto water and oil in cool dark place for immediate use or in the refigerator for extended usage. The seeds washed and dried from the pulp separately from the pulp for culinary use. In England, it is used to color dairy produce such as Red Leicester and Cheshire cheeses. Annatto imparts a wonderful color to oil when fried for a few minutes. The seeds infused in hot water until the color is as intense as required. Then, add the water to rice dishes as a substitute for saffron. Annatto has several industrial applications. It is used to color cheese, sauces, butter, margarine, mayonnaise, sausage, soup, juice, ice-cream, and confectionaries. 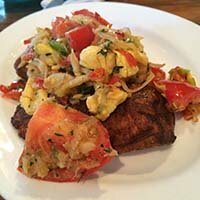 The famous Jamaican national dish of saltfish (cod) and ackee is served in a vibrant sauce colored with annatto. The Spanish introduced the spice to the Filipinos and it is used extensively in their cuisine. Consumption of dishes prepared using annatto colorant is safe, and allergic reactions are rare to occur. (Medical disclaimer). <<-Back to Spices from Annatto. Visit here for an impressive list of healthy spices with complete illustrations of their nutrition facts and health benefits. Traditional Uses, Chemical Constituents, and Biological Activities of Bixa orellana L.: A Review (opens in new window). Effects of Annatto (Bixa orellana L.) Seeds Powder on Physicochemical Properties, Antioxidant and Antimicrobial Activities of Pork Patties during Refrigerated Storage. Gernot-Katzer's spice pages. (Opens in new window).